Sophie Pierszalowski strolled down the hall one day with her supervisor to attend to a routine task. Upon returning to her office, she found a surprise on her desk — two red claw crabs crawling slowly about in a small aquarium. Students in a program that Pierszalowski runs had picked Claude and Jean-Pierre, as the crabs were later named via a Facebook poll, to thank her for all she does. Pierszalowski provides guidance to students in science, technology, engineering and math (STEM) majors and helps them find work in research labs. But she doesn’t advise just any students. The STEM Leaders Program aims to expand the ranks of those who are underrepresented in science — women, ethnic minorities and those who are the first in their family to attend college. If the crabs represent one thing, it’s that Pierszalowski does much more for these students than just assist them. Pierszalowski is improving the outlook for STEM students at Oregon State University, but the picture nationwide is still pretty grim. Roughly half of the students who start college in STEM majors don’t complete degrees in those fields. According to the National Center for Education Statistics, 48 percent of bachelor’s degree students and 69 percent of associate’s degree students leave STEM fields within six years of starting college. Research experience appears to be one of the solutions. A study from the University of Georgia, among others, has shown that students who get involved in research labs are more likely to succeed. One of the reasons may be that research helps students integrate into the college environment. They get to know professors personally, which helps to establish that scientists are real people, no different in essential respects from friends and family. In a classroom, students may see the lecturer as “Dr. Know-it-all” instead of a human being. Breaking down that wall gives students the confidence to ask questions or attend office hours. Additionally, knowing that a professor is an approachable person can help students to imagine themselves as scientists, professors or doctors. Being part of a research team also provides students with a support network and a sense of belonging. These often overlooked factors help keep students enrolled in STEM degrees. Why do students today need all this help? Technology is advancing at an astounding rate. Even the monthly iPhone, iPad, and Microsoft Office Suite software updates can confuse most college grads. Research teaches students problem solving skills that help them to adapt to the rapidly changing modern world. If the United States wants to stay at the forefront of modern industry, it will need a workforce that is not just trained in STEM fields but also resilient in the face of change. In 2012, the President’s Council of Advisors on Science and Technology (PCAST) recommended that the best way to increase the STEM workforce is to expand the pool of college students in these fields. That’s the goal of the STEM Leaders Program, which is funded by the National Science Foundation (NSF) to provide resources for students from underprivileged backgrounds. 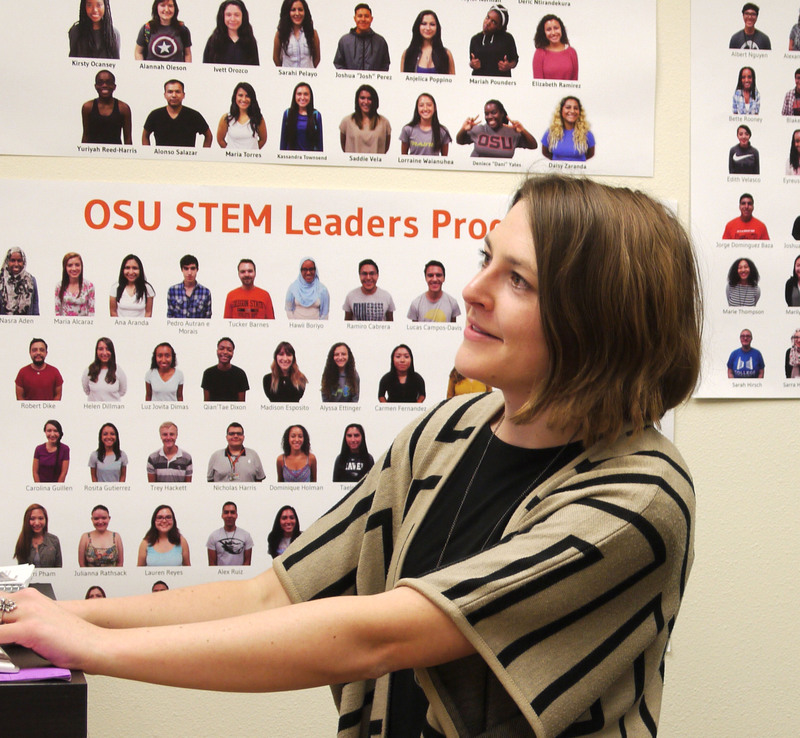 The STEM Leaders program is now in its third year at Oregon State. During that time, it has helped nearly 150 undergraduates to join research labs. These students come from small rural towns and immigrant families. Many are the first in their family to go to college. Some have physical disabilities. Many of these students wouldn’t do research during their undergraduate experience if it weren’t for the STEM Leaders Program. While the program itself plays a large role in recruiting and supporting students in their academic and research goals, a big part of its success lies with Pierszalowki. Since her time as an undergraduate at University of Washington in Seattle, she has consistently walked the line between research and outreach. She archived photos, taught courses and worked in a lab. After studying whales in Alaska for years, Pierszalowki came to OSU to pursue her master’s in the Department of Fisheries and Wildlife. She contributed to understanding the “molecular ecology” of whales and determine the genetic factors of humpback whale migration and feeding. Pierszalowski describes her master’s work as “a conservation success story for humpbacks,” however it was during this time that she realized that she wants to help others reach their science dreams. 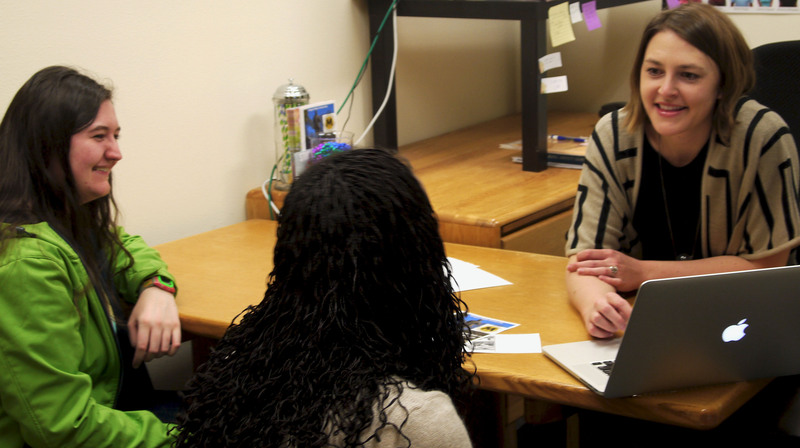 Pierszalowki’s impact as a student adviser would be apparent to anyone who enters her office during an afternoon full of appointments. Students swap tips on which professors teach the best classes, gripe about the pile of papers they have to write and commiserate over the coming onslaught of midterms. An adviser’s support is invaluable to students who don’t have a robust support network. The STEM Leaders Program also provides students with a framework to achieve success in difficult majors. Students begin their fall term with an introductory course, which Pierszalowki describes as a “crash course in general STEM research practices.” The students learn everything from how to act professionally to what a lab meeting is like and even how to compose an email to a professor. Often, these first-time professional interactions pose a huge hurdle for students, who come from a very different environment than an academic research lab. Orphaned in Ethiopia until she was five years old, Eyreus Rooney and her twin sister Bette did not start their life with high odds of success. In fact, right before they were adopted, the Ethiopian government established laws preventing Americans from adopting young Ethiopians. An impassioned legal battle eventually resulted in new hope for the two young girls. They moved to Anchorage, Alaska, with their new mom, a world apart from their birthplace. As teenagers, they moved to Ellenborough, West Virginia, and then to Battle Creek, Iowa, finally settling in Enterprise, Oregon, for high school. A life on the move can often make a young person struggle to fit in and find an identity and purpose. Fortunately for Rooney, she has had the example set forth by her single mother, a clinical lab technician, who always worked hard to provide Rooney with a stable home. Now in her second term, Rooney has started working in the lab of Molly Kile in the College of Public Health and Human Sciences. She is delving into the health consequences of arsenic exposure in Bangladesh. Over the next year, her research experience will provide an opportunity to apply what she is learning in class. As a young boy in Claremont, California, Gabriel Sandoval watched his grandmother rescue and nurse injured birds back to health. Once he was old enough, he couldn’t help but carry on with what his grandma taught him. “I’m always half listening for birds when I’m walking,” says Sandoval. While this may make it difficult to have a conversation with him outside, it’s hard to be bothered by someone with that kind of passion. In high school, Sandoval got more serious about his bird hobby and joined the local Audobon Society chapter. As he listened to stories and looked at pictures from the older club members, the budding ornithologist dreamed about all the exotic places he would someday go to study birds. However, before Sandoval could go on these awesome adventures, he’d need to gain some more formal experience in ornithology. Now a sophomore at OSU, Sandoval has been in Doug Robinson’s lab for over a year thanks to Pierszalowski and the STEM Leaders Program. Research has gone so well for Sandoval that he and Robinson are gearing up to publish on a ten-year study of the Yellow-rumped warbler of western Oregon. In addition, Sandoval helped run a citizen science project cataloging state birds as part of the Oregon 2020 project, which aims to collect thorough data on the distribution and abundance of bird species in Oregon. Through all of this work, Sandoval’s excitement about birds hasn’t waned. His love for these animals is contagious. It isn’t surprising to hear about some of the other activities Sandoval has gotten involved in. He has become an undergraduate research ambassador and an officer in the OSU chapter of the Society for Advancement of Chicanos/Hispanics and Native Americans in Science (SACNAS). He is a member of the College of Agriculture leaders, member of Minorities in Agriculture, Natural Resources and Related Sciences (MANRRS), and chair of the OSU Bird Nerds. To top it all off, Sandoval attended the national SACNAS conference last year and talked with some of his favorite Ornithologists. As his official time in the STEM leaders program comes to an end, he is hoping to continue his research in the Robinson lab and eventually apply to graduate school. Alannah Oleson grew up in a small mill town of Roseburg. Computer science wasn’t an emphasis in the public school system, but that didn’t stop Oleson’s mother. When Alannah was in middle school, her mom got a community college degree in information technology. Inspired by her mom’s example, Alannah also decided to pursue a degree in computer science. However, another road block emerged when computer programming classes were cut from the high-school curriculum. That made her first year of computer science at OSU a struggle. She credits guidance from engineering professor Margaret Burnett, Oleson’s research adviser, and the other students in the lab for helping her through those early classes. 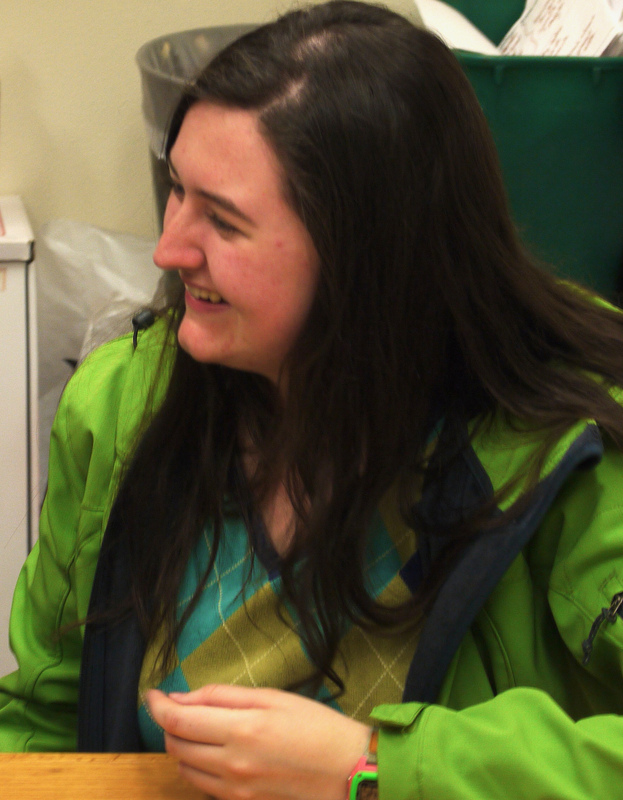 “If it weren’t for her lab mates, I wouldn’t even be in computer science anymore,” says Oleson. Now in her junior year at Oregon State, Oleson has worked on several projects in Burnett’s lab, and she has focused on one called GenderMag. Using this software, researchers hope to better understand gender inclusiveness bias, the idea that computer software can favor the working styles of men or women. The issue affects participation in STEM fields, especially computer science, which has a low ratio of females to males. While this work builds on almost a decade of study in Burnett’s lab, Oleson’s success has led to a research scholarship and a potential job opportunity at Adobe. Oleson is still weighing her options and may pursue a graduate degree in computer science. “I would never have even considered research as a career without the Stem Leaders Program,” says Oleson. These days she is giving back to the program that helped her reach her potential by mentoring younger students. 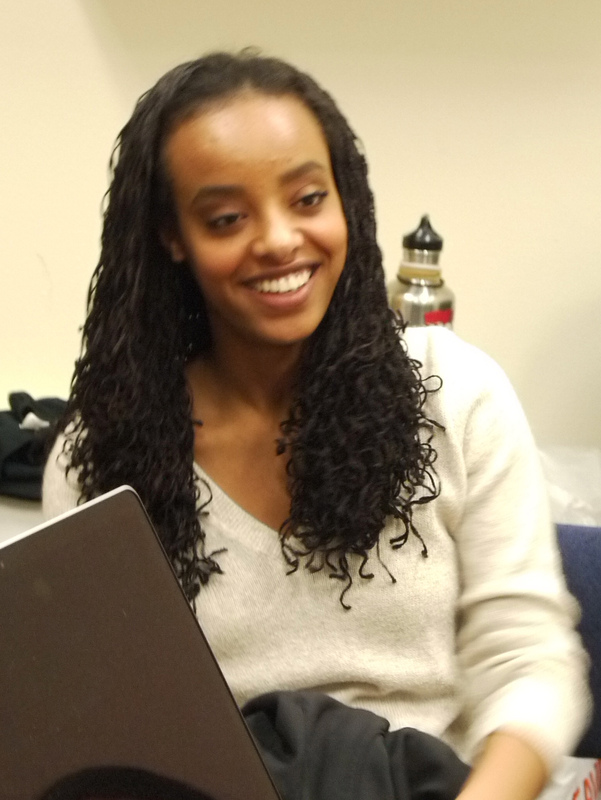 Oleson credits this new responsibility with helping her to mature from a young undergraduate, worried about passing her classes to a burgeoning computer scientist with a research scholarship offer. Just as each of the students in the program has grown with new research opportunities, Pierszalowki has evolved in her role. In addition to being program coordinator, student adviser and sounding board for STEM leaders, she is also a Ph.D student in science education and university teaching. For her dissertation, Pierszalowki is recording and analyzing data on the outcomes of STEM Leaders Program experiences. Her study can help policymakers and granting agencies understand the impacts on students’ lives. And better understanding of what does and doesn’t help students, she says, will improve higher education programs across the country in many fields of study. However, the best way to see the benefits of the STEM Leaders Program may be to just drop by Pierszalowski’s office on a weekday. Editor’s note: Steve Friedman is a Ph.D. student in Biochemstry and Biophysics at Oregon State University.